Ashcroft's history is a brief one. It began with promising silver finds by prospectors from Leadville in 1879. Quickly pioneers began to settle here. By 1885 the population of Ashcroft was nearing 2,500. However, nearby Aspen was also experiencing a boom of its own. Residents began abandoning Ashcroft as quickly as they had settled it. By 1890 most of the businesses had closed. The devaluation of silver in 1893 was the fatal blow. The post office closed in November of 1912, and only a few hardy men were left. 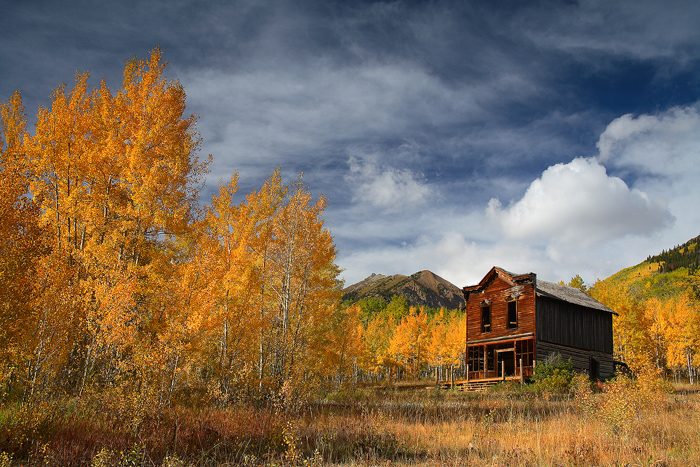 Jack Leahy, the towns last resident died in 1939, officially rendering Ashcroft a ghost town. Many of the original buildings exist yet today. This is the Hotel View. Still standing proudly among a grove of aspens. Not yet forgotten.